In the afternoon of Sunday, November 8, the Association Luisa Piccarreta - Little Children of the Divine Will was invited by the Institute of the Daughters of Divine Zeal, at Altamura. Here it was warmly greeted with a welcome reception and immediately an atmosphere of brotherhood and friendship was established. The initial impact with the Institute, almost equal to that of Corato, confirmed from the very beginning this feeling. The purpose of the visit was, of course, the spreading of the spirituality of Luisa Piccarreta the little daughter of the Divine Will: the Sanctity of living in the Divine Will, a gift that God, our merciful Father, wants to give to everyone universally. Perhaps not everybody knows the strong bond between Saint Annibale Maria di Francia, founder of the Daughters of Divine Zeal and the Servant of God Luisa Piccarreta, the mystic from Corato. This is what happened to the representative of the group of voluntary Association PADIF (Father Annibale di Francia) that works inside the Institute at Altamura. She told us that several months ago, while she was doing her volunteer service in the library of the Institute, she discovered some books concerning our Luisa and her exchange of letters with Father Annibale. She was so astonished that she wanted to inaugurate the social year 2015 in the place where you can still feel the presence of the two figures: the Institute of the Daughters of Divine Zeal in Corato where, last March, during the Lenten retreat, the first meeting with the Association Luisa Piccarreta - Little Children of the Divine Will took place. On that occasion, Don Sergio spoke about the birth and publication of The Twenty-Four Hours of the Passion that Father Annibale wanted. (He wrote the Preface to the text and added a Treatise on the Divine Will.) This year marks the 100th anniversary of publication of the book. This aroused in all present and especially in the group from Altamura a new thirst for knowledge about Luisa’s spirituality and they expressed the desire to spread this knowledge to others. So they invited the Association Luisa Piccarreta - Little Children of the Divine Will to give a testimony in their town. We took our seats in the chapel where, after presenting Sister Assunta, the Association Luisa Piccarreta - Little Children of the Divine Will. and its representatives, Don Sergio began talking about the figure of Luisa from the day of her birth on April 23, 1865. He referred to all the most important points of her life that represent her spirituality and led her to become a victim soul because of her love for Jesus and the salvation of mankind: the vision of Jesus suffering under the weight of the Cross and crowned with thorns, under her balcony; the total stiffening of her body that she called as her usual state; her continuous dialogue with Jesus and her revelations about Creation, Passion, Redemption and Sanctification to learn to live in His Will on earth as it is in heaven. A video titled "Dawn of a Mystery" was broadcast in support of all that was said. Through it we retraced the life of Luisa, since she was a child, her childhood at "Torre disperata” her perennial immolation in a bed until she died, the years spent at the Institute of the Daughters of Divine Zeal in Corato, in addition to some interviews, about her spirituality, with those who have a deep knowledge as Sister Assunta, Archbishop Giovanni Battista Pichierri, Msgr. Giannotti. All this was confirmed by those present, who politely followed what was said. 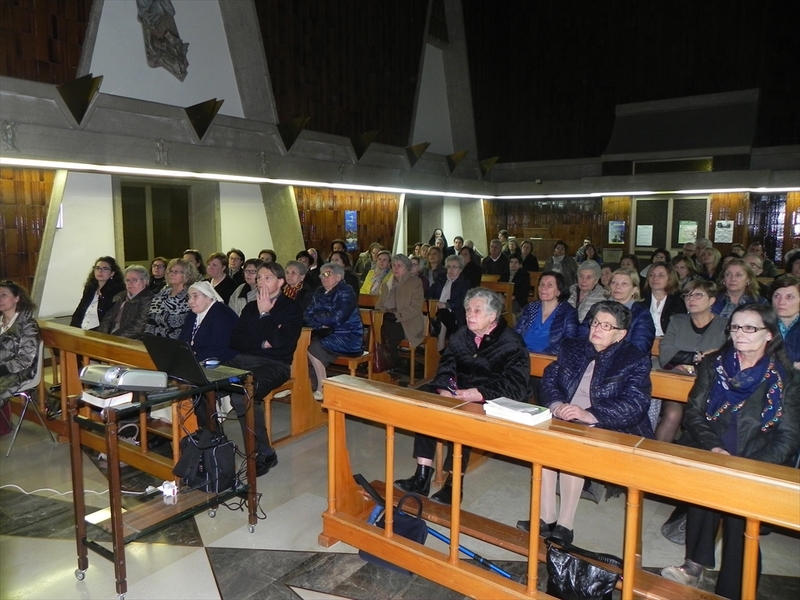 They participated and showed interest in increasing this initial knowledge, with questions and short testimonies, as Sister Luisa who “met” Luisa Piccarreta through Sister Vincenzina Caputo and Sr. Assunta, when she was in Corato. She said that when she had just arrived at the convent, she was struck by the recurring name of "Luisa the Saint " and was astonished that this could be related to her. Then she discovered that it was about another Luisa, precisely, Luisa Piccarreta, died in 1947 in the odor of sanctity. Sister Candida also gave her testimony. She lived and worked at the Institute of Corato when Luisa had already ended her earthly life. Here she was given the task to be the "teacher" of the children who attended the institute, but Sister Candida felt inadequately prepared, not ready for that task. So she began to turn to Luisa to get some help by her in any way. One night Luisa appeared to her in a dream, telling her and reassuring her that Jesus is the Master and that she would be only the dog that accompanies and is close to the sheep (the children of the Institute) never stop smiling, what she does really. Before ending, we prayed all together the last decade of the Rosary that was interrupted because of our arrival at the institute, the Salve Regina and the prayer for the glorification of our sister Luisa Piccarreta. There was still time to visit the room where Father Annibale stayed during his visits to the Institute at Altamura that the next year, 2016, will reach its centenary. In this room the bed, closet, dresser, desk, used by the Saint from Messina are kept, as well as a large glass case containing clothes and objects belonged to him. Next to the room of Father Annibale there is the room that once belonged to Father Pantaleone Palma, born in Oria (BR). He was one of the closest and main collaborators of Father Annibale. Now this room is transformed into a small museum with other objects and vestments of the Saint. Inside the institute, the mortal remains of Melanie, visionary of La Salette are kept. St. Annibale Maria di Francia had her remains moved from the cathedral of Altamura and when she was alive he really wanted her by his side because he had found in her, as later in Luisa, spiritual qualities and abilities. The mutual exchange of hospitality between the Association Luisa Piccarreta - Little Children of the Divine Will, the group of Voluntary Association PADIF, the Daughters of Divine Zeal and all the people present in the Chapel, is an invitation to keep alive the ties between the two cities, as claimed by Don Sergio, so that the knowledge of the Supreme Kingdom could spread through the intercession of Luisa and St. Annibale Maria di Francia: the firstborn daughter and the Apostle of the Divine Will.